Principal Cast : Guy Pearce, Robert Pattinson, Scoot McNairy, Gillian Jones, David Field, Anthony Hayes, Tawanda Manyimo, Susan Prior, Nash Edgerton. Synopsis: A man chases down a trio of thieves in a futuristic wasteland. What we think : Slow-burn thriller is melancholic, evocative and compulsive viewing, even though it moves at a glacial pace. Guy Pearce delivers a pivotal, standout performance, ably abetted by a nuanced Robert Pattinson, as far removed from his vampiric hunk-dom as is humanly possible. The Rover is remarkably effective. Australian apocalypse films are perhaps our film industry’s largest contributor. Considering the vast expanses of desolate, uninhabited landscapes at our disposal, it’s little wonder that films set in some post-apocalyptic time-frame are often set within our borders. Perhaps the most famous, the Mel Gibson classic Mad Max, transported audiences into the Aussie Outback with its speed, ferocity and brilliantly evocative locales. The Rover does a similar thing, and no doubt will draw comparisons to Max Max’s underlying tone, plot and setting, yet it’s a less fractious film in its narrative, less archetypal than Miller’s action classic, and contains a terrific performance from Guy Pearce, a man for whom membership on the A-list will never quite be achieved. Ten years after the fall of Western civilization, humanity has, as you’d expect, become isolated and insular. People wander the wasteland, scavenging all they can and preying on the weak. A man, Eric (Guy Pearce), a violent and vengeful man who seeks the return of “his car” from a trio of looters, meets fellow vagrant in Reynolds (Robert Pattinson), an American ex-pat who is injured by parties unknown. 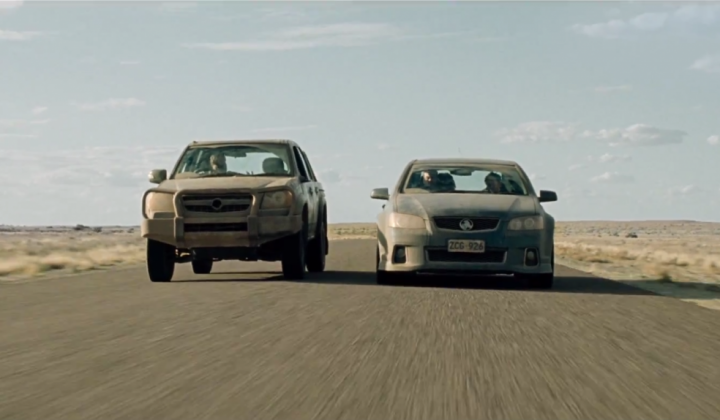 As they pursue the stolen car across the desolate landscape, they encounter others who aide them, while Eric and Reynolds attempt to bond through their mutual distrust. All that’s missing is Bruce Spence. The Rover isn’t a typical post-apocalyptic thriller. 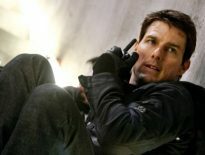 There’s very little action, at least comparative to the majority of Hollywood blockbusters, and the story and characters are revealed slowly, slowly, by director David Michod’s screenplay, which unwraps itself across 90+ minutes of malevolent, stylish, itchy-trigger-finger cinematography and editing. Guy Pearce’s Eric, a violent, rage-fueled individual for whom the idea of chasing down a stolen car is worthy of a full length feature film, and Robert Pattinson’s Reynolds, a somewhat slow second-stringer for whom Eric appears to be almost fatherly were it not for his fits of anger, are both compelling characters in their own right, not the least held together by Pearce’s seething performance. While I doubt repeat viewings will have the same strident effect as the initial bout, as the motivations and narrative arcs of both are revealed, there’s plenty of captivating, iconic moments to behold in this begrudging masterpiece. The film’s visuals and overall tone are astonishingly minimalist, which will be something a lot of people might find off-putting. Those seeking a vendetta-like gun-battle will be sorely lost here, as Pearce and Co deliver resolutely silent, contemplative and subtle characters that seem more introverted due to social structure than any facet of the screenplay deserving it. The run-down nature of many of Australia’s lonely outpost settlements (the film was shot in and around the far North region of South Australia, including Marree and Quorn) add breadth to the evaporative emptiness of this film’s landscape, a ramshackle cobbling of humanity’s dregs; while the world has fallen apart, and humans have almost become animals in their search for survival, so too their infrastructure reflects the nature of a once great species brought low by some unseen cataclysm. Michod evokes hints of John Ford, George Miller, and even David Fincher’s keen eye for detail, as he layers his film with broad, almost disparate brushstrokes of character in search of method here. The Rover is nothing if not definitively Australian, almost a Wild West flavoring of kill-or-be-killed permeating just about every frame. I still say you had the map last. Don’t blame me for us being lost…. The film runs in fits and starts, a long, slow-burn opening (including a crashing car, in a wildly idiosyncratic sequence) punctuated by moments of incredible violence (mainly by Eric) and stretched out to an almost unbearable expectation that something will happen soon. It’s testament to Michod’s restraint that he keeps the film as watchable as he does – yeah, this film movies slowly, so viewers should be prepared for it, but Michod’s direction is such that irrespective of your attachment to Eric, Reynolds, or any of the other character inhabiting this movie, you can’t help but feel drawn into the plight of our distant descendants as they scrape life together as best they can. What impressed me most was Michod’s use of long, deliberate takes, refusing to cut away from either the melancholy, the violence, or the sadness enveloping this movie and its characters. In doing so, he ensures our attention for longer, as we anticipate some kind of event to move the story along; usually, these events are violence. Wait…. you’re telling me that Ross and Rachel broke up again after that? As for the cast? Well, Guy Pearce’s bearded hot-head, Eric, who for most of the film has some enormous burden – nay, vendetta – to appease, he becomes truculent at any pause or requirement for help in achieving his mission. 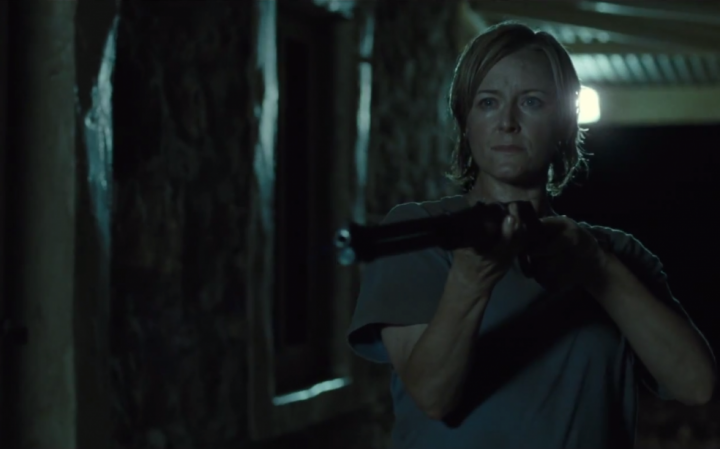 Pearce is intense, as the character requires, and you feel the rage leeching from the screen. Pattinson is actually really a surprise here, and is remarkably good as the less intellectual Reynolds, who seems to attach himself to Eric through the violence inflicted upon him. As Pattinson matures as an actor, he’s becoming more able to inhabit the roles he appears in – naturally, his Edward from the Twilight movies is as thinly plausible as the literature he’s carved from, and his performance in Cosmopolis was remarkably prescient considering I understood very little of the movie, while the less said about Water For Elephants the better – and I think The Rover is a major step forward for him in his screen career. Watch for Aussie talent like David Field (who was great in Gettin’ Square, Chopper, and the local television series City Homicide), Anthony Hayes and Susan Prior adding to the film’s roster. Ahh, the old Australian version of a Mexican standoff. The Rover isn’t your typical action thriller hybrid. It’s not filled with explosions or quaking pyrotechnics to ensure satisfaction. No, The Rover goes the other way – methodical, disciplined and restrained, The Rover is a meditative deconstruction on the human spirit when society, the fabric of our lives, fails us. 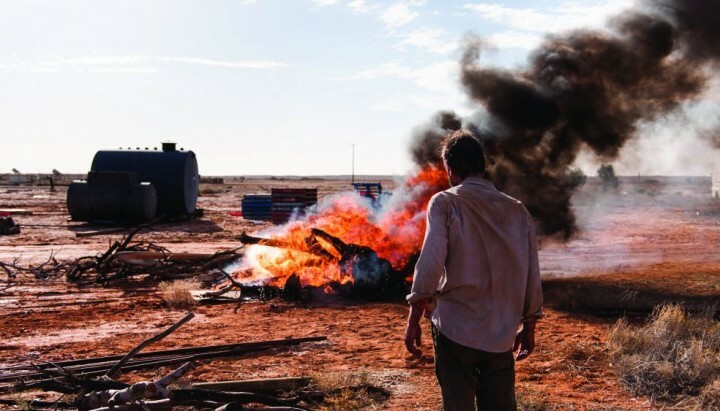 With terrific leading performances by Pearce and Pattinson, and a majestic landscape backing it up in the Australian Outback, The Rover’s charms are initially hidden and sullen, yet spurred on by the film’s mesmeric undertaking, inevitably reveal themselves to be quite effective. You’d be missing out if you didn’t watch this one. Not heard of this one Rodney. Thanks for heads up. Would be keen for your thoughts, my friend! Good review Rod. It's a very strange and eerie movie, but also one that I found interesting in its small, subtle ways. Strange? Definitely. Eerie? Absolutely. And as you say, most definitely interesting. Very happy you liked this! Wasn't expecting to like this as much as I did. Pearce and especially Pattinson were both excellent and really gave two of the best performances I've seen this year. Agreed! I wasn't expecting a performance like this from Pattinson, but I expected Pearce to deliver. The Rover is such an evocative movie, even if most people will probably be left scratching their heads about it all….